Your dishwasher is connected to the kitchen drain through an air gap, allowing air to flow into the dishwasher as it drains for a controlled drain. Without the air gap, dishwashers must siphon out all of its water or pull dirty wastewater into the dishwasher to drain. A problem with the air gap can cause the dishwasher not to drain at all, or it can cause water to leak into the sink or onto the countertop. Air gap problems are usually caused by a leak or a clog in the drain hose. If you know what to look for, dishwasher air gap problems are an easy fix. Dishwasher air gaps prevent wastewater from backing up into your dishwasher. A dishwasher with a functional air gap will pump wastewater through the air gap and into a disposal system by way of a drain hose. A clogged air gap can be a major problem and cause a lot of headaches. If you see water gushing out of the air gap, you likely are experiencing a clog and must clear your drain tube of debris. 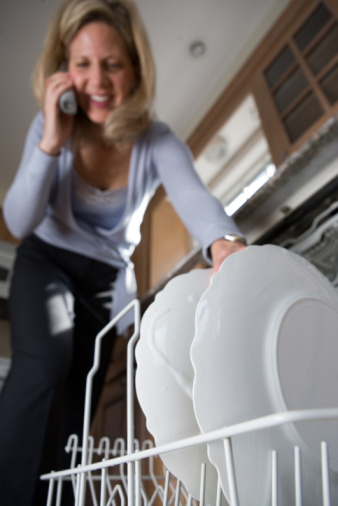 Food particles and other debris can cause problems for dishwasher air gaps. To find a potential clog, first remove the rubber hose that runs from the air gap to the sink drain or garbage disposal. Use a screwdriver to loosen the screws that hold the clamps in place at each end of the hose, and then remove the hose. Insert a dowel into the hose to clear any debris that might be clogging it. If you have a garbage disposal, examine the spot where the hose enters the disposal and look for a knock-out plug. Until this plug is removed, the dishwasher won't drain properly. This could be your problem if your disposal is new. If the plug is indeed present, hold the metal end of the screwdriver against the center of the plug and tap the screwdriver handle with the hammer until you have knocked out the plug. Make sure there aren't any foreign objects blocking your drain tube to ensure your dishwasher will begin draining properly. After you've removed the tubes to inspect them, make sure you reconnect the hose to the air gap, leaving the other end of the hose free. Dry the outside of the hose with a towel if needed. With the dishwasher on, place the free end of the hose in the sink. When the dishwasher has partially filled with water, fast forward to the drain portion of the dishwasher cycle and watch the hose for any leaks as the dishwasher drains. If you do see any leaks, circle the area with a permanent marker. That way, you can easily patch the holes later. These leaks can be tiny and difficult to see with your naked eye. If you can't seem to find any leaks, try pressing a dry paper towel to the outside of the hose to check for water, indicating a leak. If you do indeed have a leaky drain hose, a problem for dishwasher air gaps, you have a few options. Go the DIY route and spread epoxy putty over the leaky areas you circled with a permanent marker. Spread the putty so that it covers a circular area of at least a 1-inch diameter around each leak. Wait at least 24 hours for the putty to dry. This should patch any holes and prevent future leaks. Alternately, replace your leaky hose with a brand new one. Hardware stores like Lowes and Home Depot stock drain tubes for most dishwasher models.